Use your diffuser in conjunction with Forever™ Essential Oils to tap into your senses and infuse the air with the power of nature. The Forever™ Essential Oils Diffuser’s illuminating light complements the powerful aromatic experience, gradually changing to create an inviting and relaxing visual. 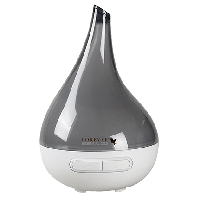 Refresh and revitalize your space with the Forever™ Essential Oils Diffuser!